The greenfinch, which belongs to the finch family, is a passerine bird with a confident posture. It is especially beloved due to its song which is pleasant to the ear and full of trills. Another name for the greenfinch is chloris, derived from the Greek adjective “chloros”, which means “yellowish-green”. It is a non-migratory bird with a total length of 14-16 centimetres. What sets it apart from the rest of the species in its family is its stocky posture. Its sturdy, conic, rosy, ivory beak is so strong that it allows it to break and peel seeds, while in the same time eat insects, worms, thorns, sprouts and small fruits which compose its diet. Juvenile greenfinches have gray-white, diffusely striped plumage. The adult male has “moss green” plumage on its back, a yellow-green breast, it is grayish at the sides of the head and it has a light gray wing plate. In sitting position, the greenfinch distinguishes itself from the yellow edges of the primaries, while during flight the yellow at the sides of the base of the tail is also visible. The tail is narrow and forked at its edge. The adult female has more faded and dull gray colors, a brown shade with faint streaks on the back, and less yellow on its wings and tail. It has reddish, flesh-colored legs. It builds an open, basket-like nest often on cypress trees, evergreen trees or lush bushes. The greenfinch is a cautious and shy bird, especially during its breeding season, which for the greenfinch starts from April and goes on until July. For the construction of its nest, the couple uses dry grass, animal hair and moss. The female lays 4-6 white-azure eggs with brownish streaks. It incubates the eggs, depending on the environmental conditions of its habitat, from 11-15 days. Both parents actively participate in the upbringing of the chicks for at least three weeks, and by the end of October the chicks have grown enough to be able to survive the harsh icy winter in Greece and in Europe, where the bird is found. We usually come across the greenfinch in forest edges, groves, bush lands, while in the city we can often see it in parks and gardens. It is indigenous from Ireland to the Urals, Arabia, Southeast Africa, Israel and North Persia. The further up to the north the greenfinches live, the bulkier and duller in colors they are, compared to the birds that appear more to the south. They are generally more resistant to the cold and diseases than other birds of the same family. This fact, together with its pleasant, elaborate and long-drawn song, which is full of trills, quick whistles and twitters that resemble canaries and Tree pipits, has rendered it an easy bird for breeding. Other species of greenfinch that can be found are the greenfinch of the Himalayas Carduelis Spinoides, the Oriental greenfinch Carduelis sinica and the black-headed greenfinch Carduelis ambigua. For the greenfinch to reproduce under breeding conditions you need a spacious cage or, ideally, a 2-meter long x 1-meter wide x 2-meter high crate for each couple. We offer the couple an open indoor nest, similar to that of the canary, and for its construction we need moss, thin dry grass and thin 5-6 centimeter roots or coconut fibers. We avoid cotton because it gets entangled in the legs of the greenfinch and it makes it difficult for it to knit its nest. It is preferable for the nest to be clothed with leaves earlier so as to look as natural as possible, in order for the birds to feel safe and isolated. The owners’ presence had better be as discreet and calm as possible, thus not harassing the couple. Greenfinch breeders should offer the birds, except for cleanliness, daily supply of fresh water, a wide variety of seeds, fruit and vegetables, a bird bath where they can bathe and cool themselves. During the delicate breeding period, when the females have increased calcium needs due to spawning and the skeletal growth of the chicks, it is necessary to administer cuttlefish bone and increased animal proteins in the form of dried insects and worms. 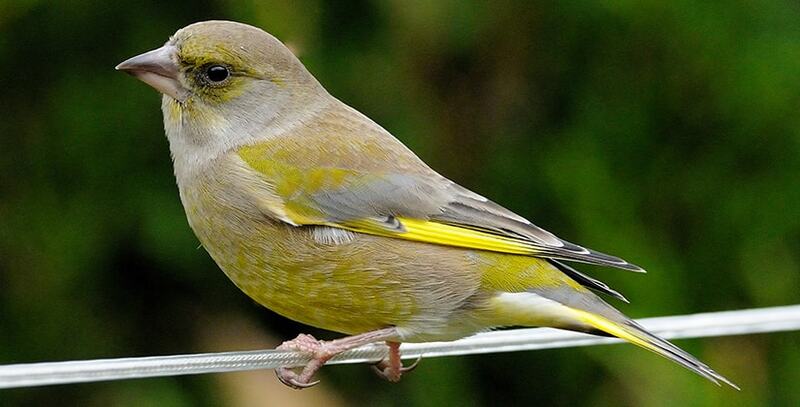 The greenfinch is easily crossed with canaries, resulting in gorgeous greenish mules with unique vocal abilities.